When I saw this Weekly Photo Challenge: Companionable on The Daily Post at WordPress, I knew I just had to post about a few of my little companions. I have had so many wonderful little animals to come into my life and bless me. It would be way too long a post to try and present all of them. So, today I present the most recent. Allow me to introduce Bobby, Emmy and Pippin, our rescues! Bobby was our Boston Terrier. I’m sad to say we lost him last year to cancer at the age of 13. He was a leap-year baby, born February 29, 2000. 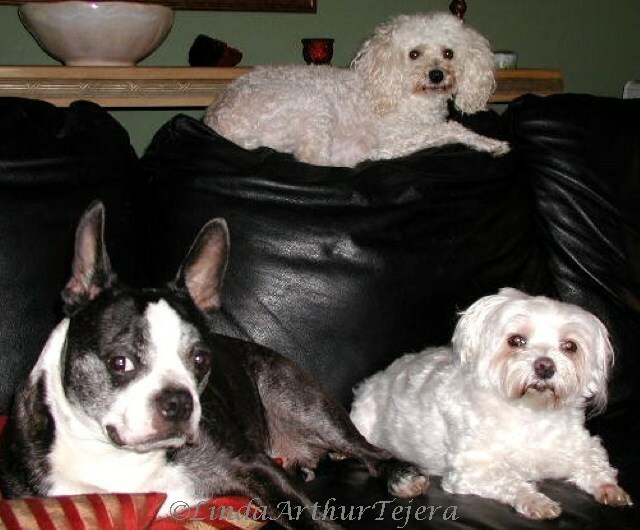 Next to him sits our little Emmy, a Maltese we acquired back in 2000 at 3 months old from Florida Poodle Rescue. She turns 13 this fall and gets more ornery and lovable with each passing year! Our Poodle, Pippin, came to us one day about ten years ago out of nowhere. He came to our front door, a skinny, matted little mess and let me bring him in and clean him up. We tried for weeks to locate his owner to no avail. We had people tell us they had seen him roaming their neighborhood a few blocks away from us for the week prior. I was appalled that he could have been left alone for so long. A trip to the vet could not conclusively give his age but he guessed maybe around one year at that time. They share our home with five cats! This week’s Challenge, brought to my attention by Lens and Pens by Sally, is a Challenger’s Choice. Choices offered are: Abstraction, Architecture, Food Photography, Night Photography, Portraiture, Still Life, Street Photography, and Travel. I chose Architecture. This is my first time to post to this. I had seen her blog and thought it would be something really fun and different. Since I just recently acquired an iPhone 5, I have not taken many photos with it yet. But I went back through some of the photos I had from my iPhone 3Gs and decided to try this. I used the Snapseed App to try to work it up a bit and make it more presentable. I’m new with that, too. 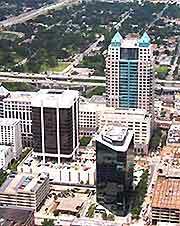 My photo was taken during a lunch hour from an 8th floor conference room on South Orange Avenue in downtown Orlando, Florida, probably around 2008-2009. 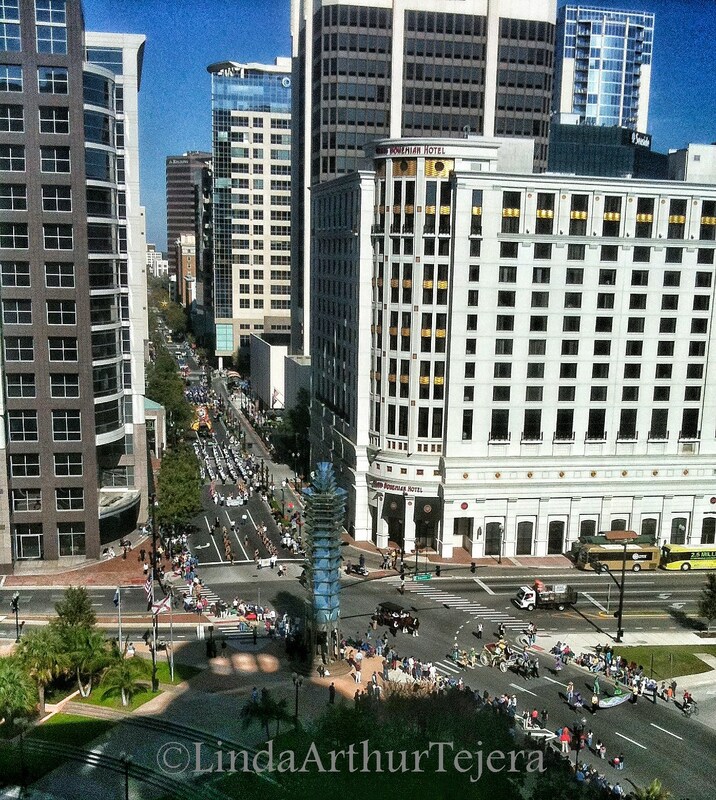 I can’t recall the holiday but, as you can see, there was a parade, which was what drew me to the conference room in the first place! had a few “skyscrapers” but nothing like what it has become. Thumbnails are inserted to try to give a bit of reference. 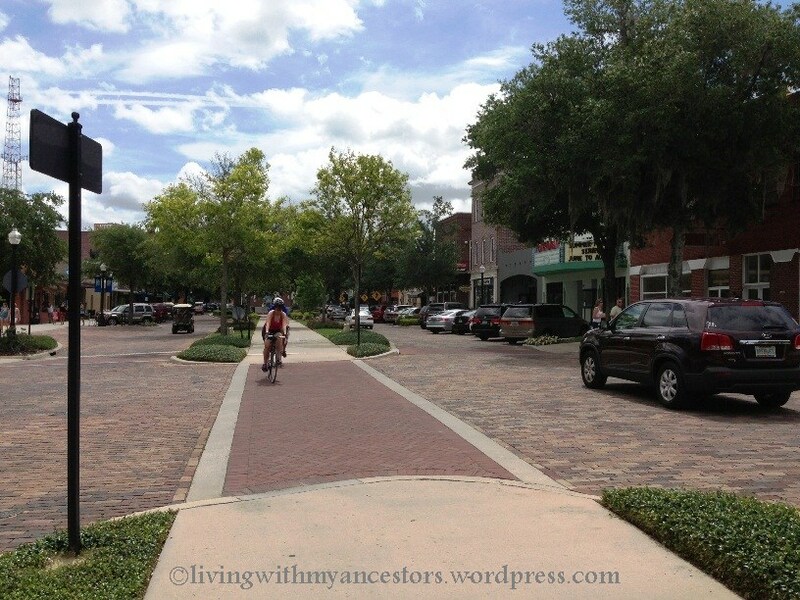 Orange Avenue, which is the main street (one way) through town, was more open and airy. 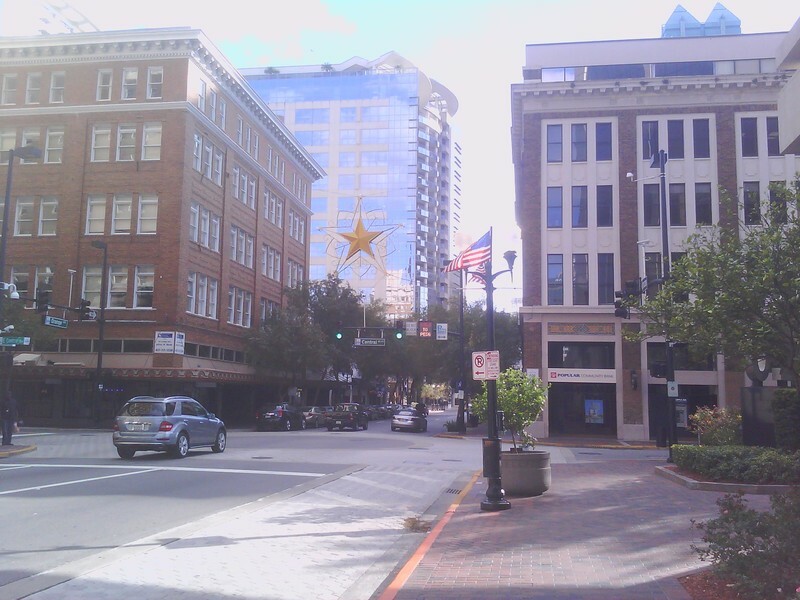 I changed jobs in 2000 and did not have reason to return downtown again until the end of 2004. In my absence from downtown, and in my humble opinion, the City managed to completely obliterate most of the light from Orange Avenue by constructing rows of tall office buildings on both sides of the street. And major downtown construction continues. 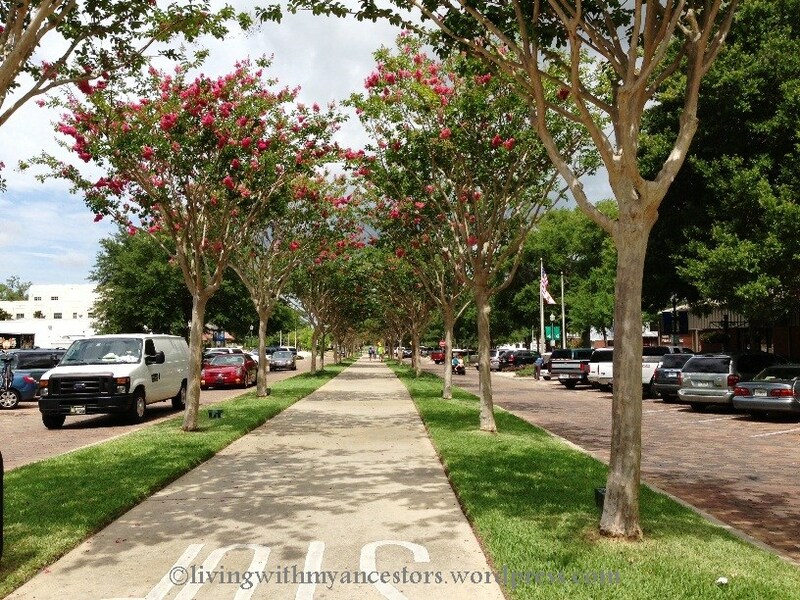 With the “new” downtown, driving to work in the morning on Orange Avenue felt so claustrophobic to me. They had made it dark and dreary. Of course, my pictures were taken during the noon-day sun. I’m sure there are many who would definitely disagree with me about the dark and dreary and that’s okay. I did not think it was an aesthetic improvement. But, then, I’m one of those who prefers the vintage style in just about everything – including architecture! Oh, well. Such is progress, I’ve heard it said. At the time of his marriage he was Captain of the Steamer “Alto” owned by his father and his first cousin Jake Rice, together with Samuel Short. 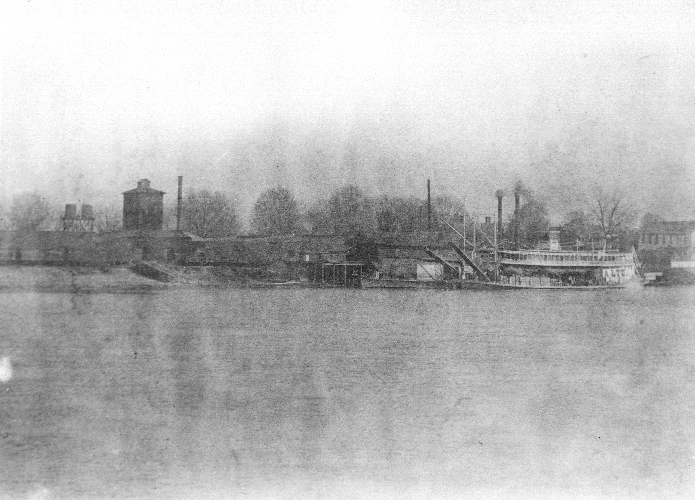 In 1856 he was still Captain of the “Alto”, as in June 1856 he was issued a Pilot’s Certificate Number 331, in accordance with the Act of Congress, approved August 30, 1852, to operate a Steamboat on the Big Sandy River. He was probably issued one in prior years, but this is the only one listed among documents that were in my aunt’s possession. In 1857 or 1858 they migrated with his parents to Cordova, Rock Island County, Illinois where they had purchased a large farm on the banks of the Mississippi River on which they built their big white house. After the death of his mother, Amanda Burns Hatcher, on January 22, 1861, and the second marriage of his father to Mary Ann Branham on August 22, 1861, John Burns and Elizabeth returned to Louisa, Ky. 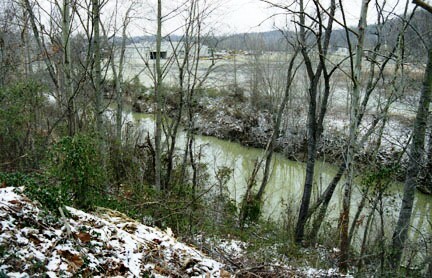 In 1864 John and his first cousins, John M. Rice and Jake Rice, together with Lloyd B. Dennis leased from Thomas Wallace (his father-in-law), five thousand acres of land on Big Blaine Creek and its tributaries, and the waters of East Fork of Little Sandy, for the drilling of oil and other privileges. On April 5, 1865 John, along with his first cousins, John and Jacob Rice, purchased the mineral rights to the Mary J. Potter Farm, situated on the Big Sandy River, Lawrence County, around Fallsburg, Kentucky, for the sum of $100.00. Oil was discovered on this property about 1916, but there was a court battle over the ownership of same which was not settled for several years. These wells are still producing (as of the 1980’s). On July 11, 1865, he purchased one thousand shares of stock in the Greater Kentucky Oil Company, incorporated by the State of Kentucky on January 17, 1865, of which his cousin, John M. Rice, was President, and ________ Owens, Secretary and Treasurer. He was issued two certificates of stock for 500 shares each at $10.00 per share or a total of $10,000.00. In September 1865 they were living at Southpoint, Ohio, which was across the Ohio River between Ashland and Catlettsburg, but no record as to his occupation. In August 1867 they were living at Catlettsburg, Boyd County, Kentucky. The Court from personal knowledge orders that a certificate of honesty, probity and good demeanor be granted John B. Hatcher of this County. The undersigned two of the Circuit Judges of the Commonwealth aforesaid, certify that John B. Hatcher, Esq., of Boyd County, produced to us the certificate of the County Court, that he is a gentleman of honesty, probity and good demeanor; And we have examined him touching his qualifications to practice law, do find him qualified. He is hereby licensed to practice Law in any of the Courts of this Commonwealth. Given under our hands, June 5th, 1868. Judge of the 16th Dist., Ky. It is ordered that John B. Hatcher be appointed a Commissioner to investigate and report to this court the number and character of the public books now in possession of the public office for the State of Kentucky in the County of Lawrence. He is directed to ascertain and report the number and character of said books that have been lost or destroyed, and as far as he is able to do, to ascertain how and in what manner they were lost or destroyed and in whose possession they were at the time of such loss or destruction; whether it occurred by the fault of neglect of the public office having the custody thereof; and will report his proceedings to the next term of this court with an affidavit as to the findings thereof. When he returned to Louisa in 1868 or 1869, he entered into a partnership with R. F. Prichard, Attorney; Firm known as Prichard and Hatcher, with offices in the brick building on the Public Square, which R. F. Prichard had purchased in 1865 from Lawrence County Court per the following found in Court Orders, Vol. 5 – 1863-1871, page 76. It appearing to the satisfaction of this Court that the brick building, formerly occupied as Clerk’s Office, has been by the County Court condemned. It is now ordered that the house be and is hereby sold to R. F. Prichard of Louisa, Ky., with the knowledge of keeping said house on the Public Square for the time of 10 years and R. L. Vinson is appointed by this Court commissioned to convey the same to him in the name of the Justices of Lawrence County, Ky., and the said R. F. Prichard is not to charge the County of Lawrence for the next year for his services as County Attorney for said County; and the said Prichard is to give said Vinson a receipt for the same and to that effect by him to be filed in the Office of the Lawrence County Court. This day John B. Hatcher presented his Certificate of Election as County Attorney for Lawrence County, Kentucky; and thereupon took the oaths required by Law; and Jake Rice, the present acting County Attorney, is ordered to deliver to said Hatcher all books received by him as County Attorney of every description. Ordered that John B. Hatcher, as County Attorney for this County, bring suits and all bonds due this Court, as justification for the non-compliance with contracts. James Wellman & Flora, his wife, of Catlettsburg, Boyd County, Kentucky, for the sum of $2,000.00 to Elizabeth C. Hatcher, wife of John B. Hatcher, in fee simple. All that certain Block or Square, situated, lying and being in the town of Louisa, Lawrence County, Ky., known on the Plat of said town as Lots Nos., 75, 76, 77 & 78. 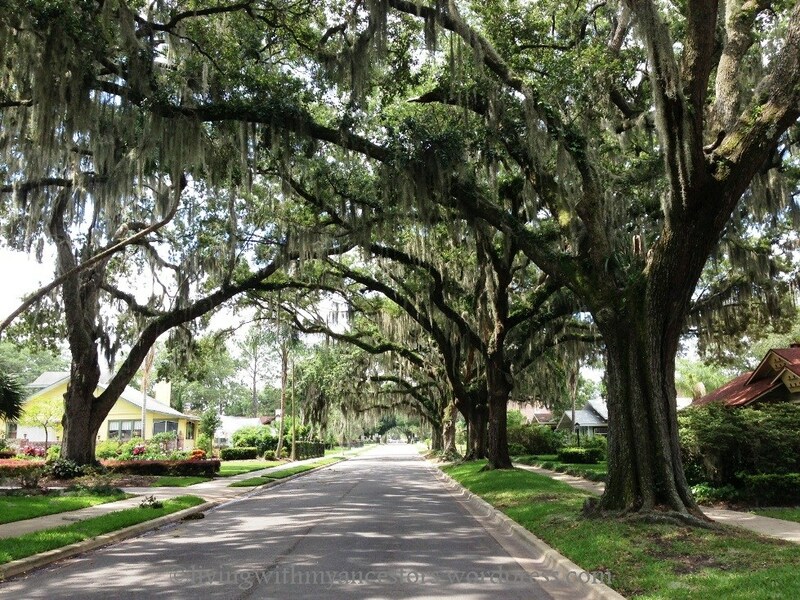 It being the property where the said John B. Hatcher now lives and the same deeded byR. 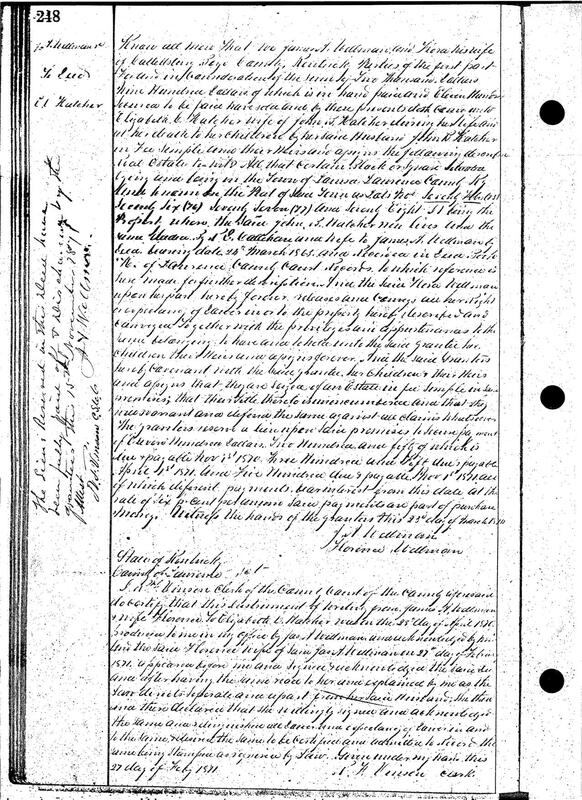 D. Callihan and wife, to James A. Wellman, by deed bearing date of 24th March 1865, and recorded in Deed Book “H” of Lawrence County Records, to which reference is here made for further description. Recorded Deed Book “J” — Pages 248 & 249 March 1, 1871. On March 3, 1875 John Burns Hatcher died, cause unknown, but he suffered with pains in his stomach all night before his death. It later was thought he probably had a ruptured appendix as his symptoms were the same as at the present time with appendicitis. R. F. Vinson presented to Court the following resolutions which with the unanimous approval of the bar were directed to be recorded. That it is with profound sorrow that we are called upon to mourn the death of John B. Hatcher late a member of the bar in this Court who departed this life at six o’clock P. M., March 3rd 1875. 2nd. That he was a man possessed of great legal ability and kindness of heart and by his death we have lost a friend, the community a good citizen and his family, with whom we deeply sympathize, a kind husband and an indulgent father. 3rd. That these resolutions be spread upon the records of this Court. A copy to the Wayne Advocate and the Catlettsburg Enquirer with the request to publish same. John was buried with services by his lodge, International Order of Odd Fellows, and they implanted their emblem in his tombstone. He was buried in the old cemetery beside his two children, Mary A. and Frank, who had preceded him in death. 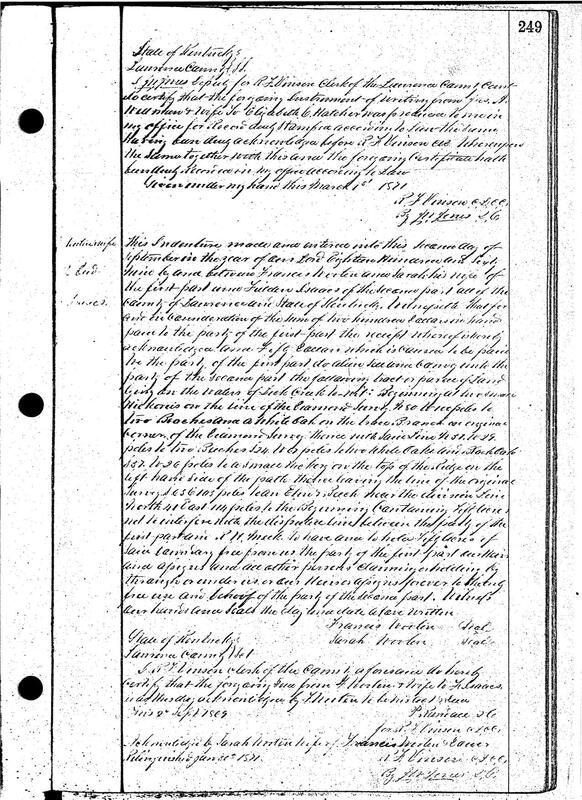 Burial Permit issued by Pine Hill Cemetery, Louisa, Kentucky, on December 10th, 1884, granting permission to bury J. B. Hatcher, Frank Hatcher and Mary A. Hatcher. Elizabeth was sought by many a suitor for her hand in marriage, turning all of them down, as she had twenty years of marriage bliss with John, whom she loved very deeply, and wanted no one else. She took up the task of raising their children alone and made sure all of them received a good education. John Burns, along with his father-in-law, Thomas Wallace, enlisted in Co. I – 68th Regiment Kentucky enrolled Militia Infantry, on 21 May 1864 and served through 22 Jun 1864 as a Commissary Sergeant. He was not issued a uniform nor did he receive any pay for his services. On 16 Jan 1915 Elizabeth applied for a pension under the Act of 19 Apr 1808, but her claim was denied since he only served thirty days. Claim No. W. O. 1040,965 and, since he was not wounded and no health problems due to service. During his service they made a raid on the Rebels in West Virginia where it is said they killed one man at Licking Ridge; also made another raid somewhere in Kentucky and captured Col. Cly Bibell (Bihell? ), a commander general. 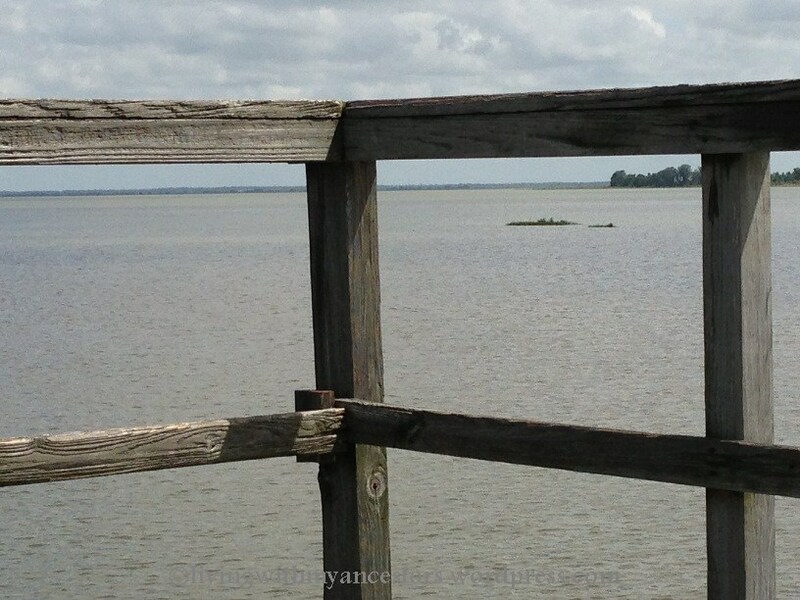 Well, while waiting on some genealogy documents to come in for an ancestor post I’m working on, I decided I’d go ahead and post some photos I took last weekend when we walked down to Lake Apopka. I will say that it was sooo hot! I guess the afternoon is not the time to go walking in Central Florida! It was a beautiful day but, as usual at this time of year, the weather was having a tough time deciding when to rain. It didn’t start up until later in the afternoon. 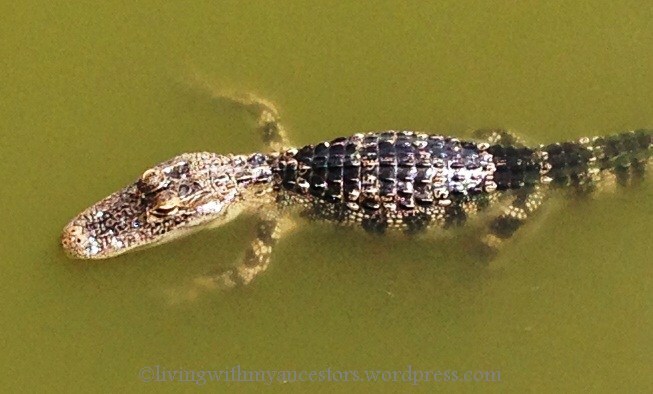 I was hoping this trip to catch some gators — well, not really “catch” any, but get some better photos. I did. I still think these are very young ones because they’re not real big. 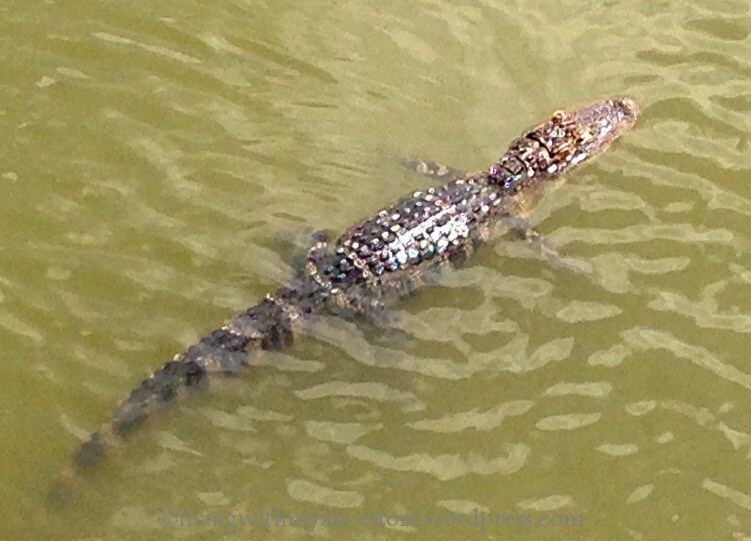 Of course, they’re much bigger than I’d ever want to come face to face with! So, here you go. I hope you enjoy! And they saw us. Oh, they were really playing it cool. 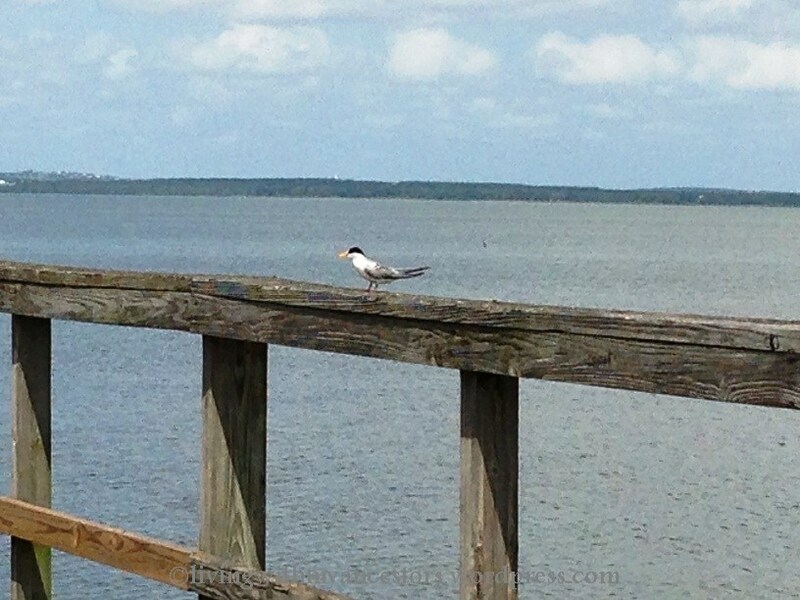 The only bird that landed on the pier while we were at the end. I have no idea what kind it is. 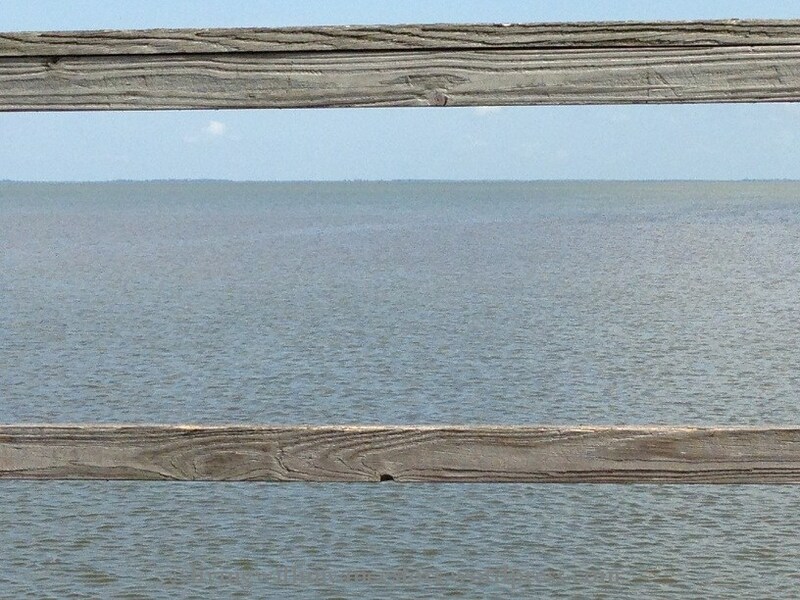 Just sitting on one of the benches at the end of the pier enjoying the view! Okay, it’s too hot for man and beast. We’re outta here! Saturday morning and not a whole lot going on. We certainly didn’t feel like doing much work around the house! So, we decided to go ahead and walk down to the Farmers Market. We didn’t even need anything. Well, I did want to get some more local honey. Not to mention that I wanted to play with my new iPhone 5 camera. I’m not real happy with my pictures yet. I still want to learn how to edit and do different things with the pictures. Right now it’s just point and shoot! I discovered that the zoom on my camera phone wasn’t working properly. It kept cutting off part of the picture, as you can see above. After we got back home, I went online to see if I could figure out if it was me or the camera. I didn’t want to go all the way across timbuktu to go to the Apple Store. But it seems like it has turned out to be a simple fix. I rebooted and that seems to have corrected whatever was wrong. Go figure. I keep forgetting these smartphones are minicomputers! So now I’ll just have to play some more with my camera phone! 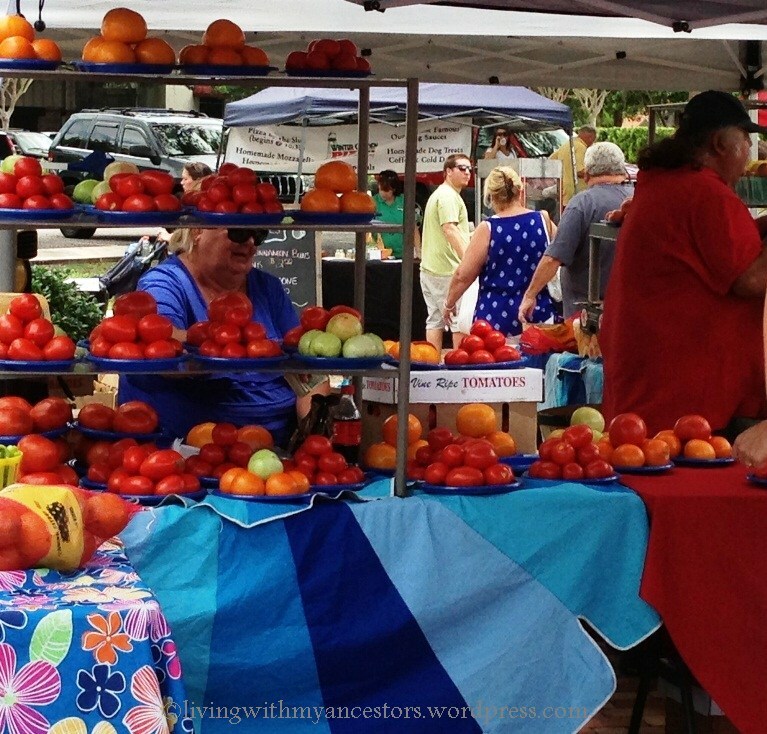 So, here’s a sampling of our trip to the Farmers Market in beautiful downtown Winter Garden, Florida. The nicest part is that it runs year round on every Saturday morning! We got a late start. We headed out probably around 11:00 am. The sun was shining even though it was supposed to be a rainy day. But that came later! 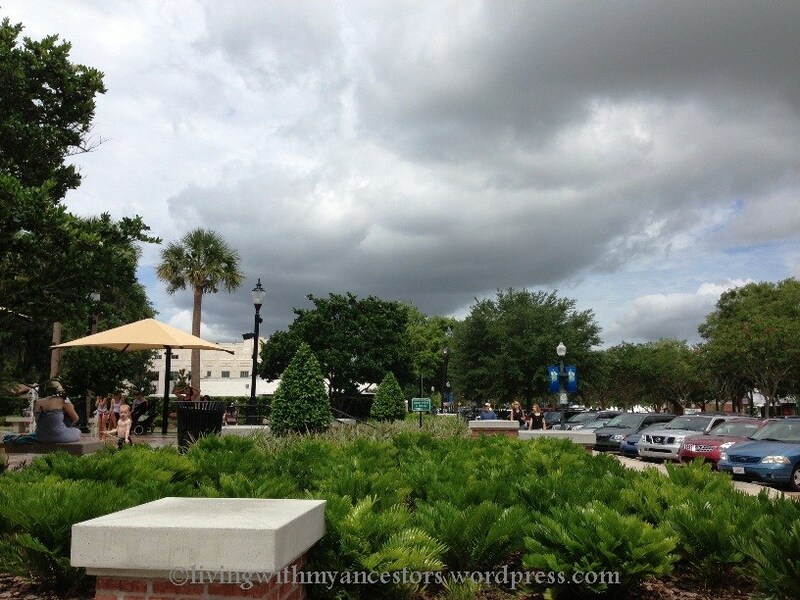 The temperature was around the mid-80’s and it was humid. Silly me, of course it was humid. It’s Florida during hurricane season. Sigh…! Anyway, it was still a beautiful morning! Downtown facing east. A number of years ago there used to be 22 miles of railroad tracks. Those were torn up and the West Orange Trail for biking and hiking was created. You can read more about the Trail by clicking here. Yes, that’s part of the Trail running through the center of downtown. Another view of the Trail and downtown, this time facing West! Almost any day of the week (that it’s not raining! 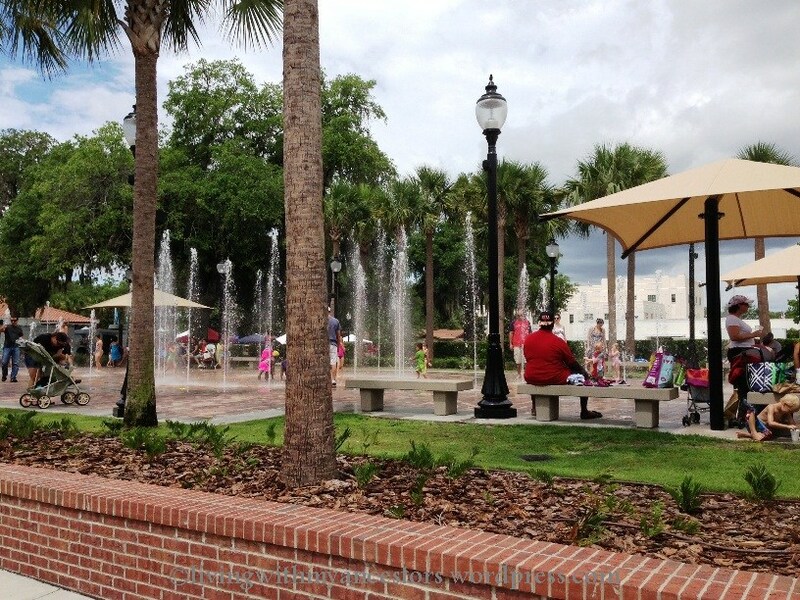 ), you can see parents and their kids playing in the water fountains. The City installed this just a few years ago. You can see part of the new City Hall building in the background, center right side. The big white building. You can find all sorts of things for sale at the Farmers Market. Not just produce. There are plants for sale, artists ply their jewelry and artwork. There are pasta vendors, nuts vendors, and bakery breads and sweets. 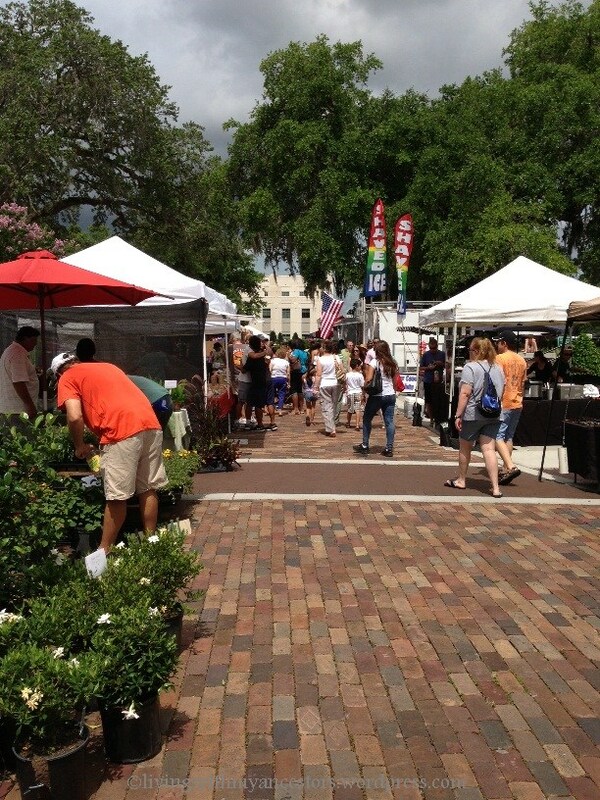 There are company vendors such as organic, holistic pet supplies, massage therapy, herbs, aromatherapy oils, etc. 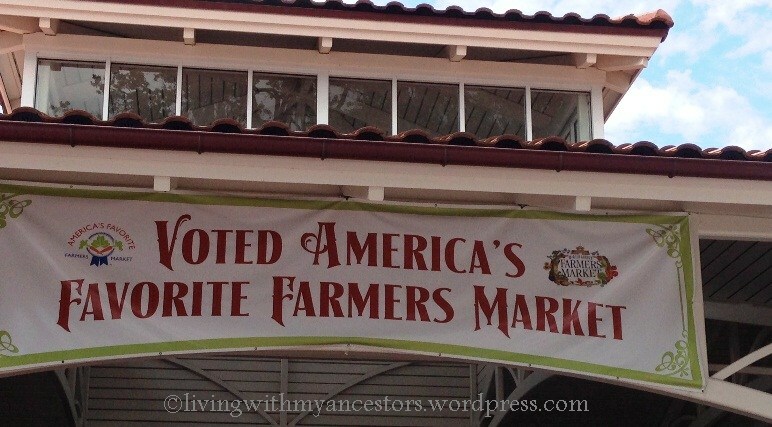 Oh, I almost forgot, the hula hoop vendor, and so much more! 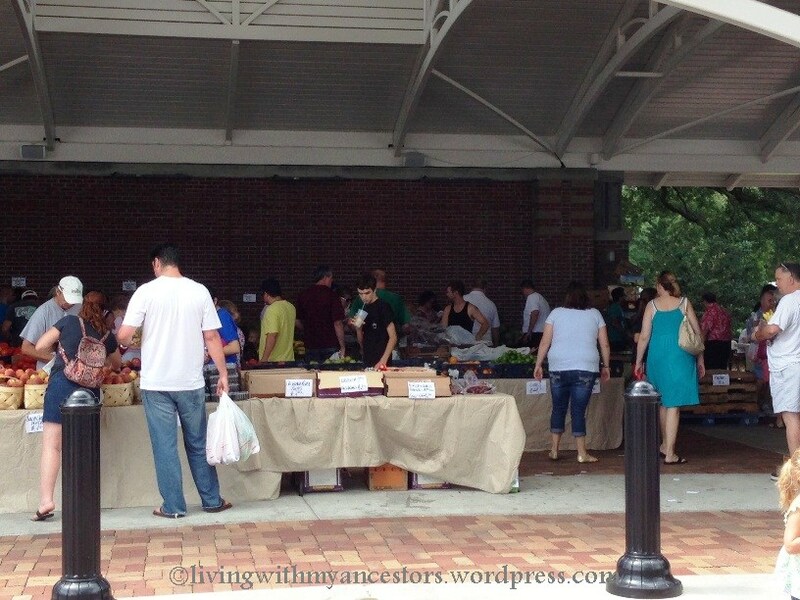 There are smaller vendors of produce. 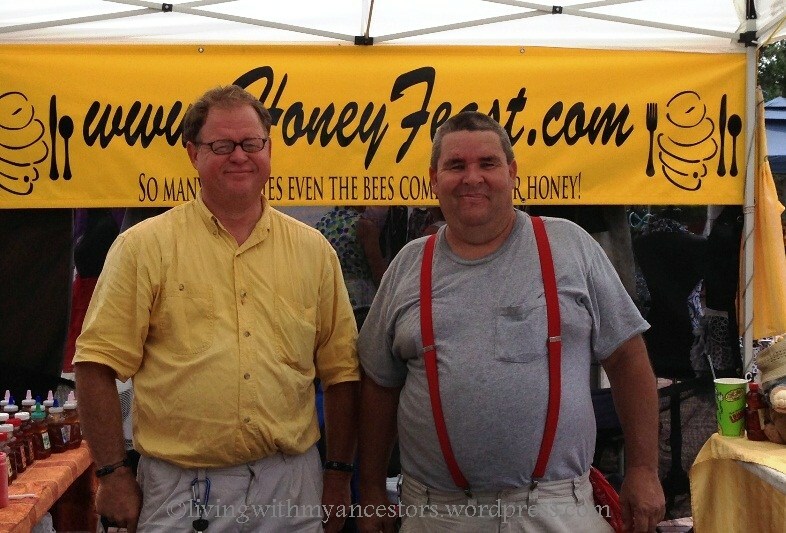 We buy our local honey from our friend, Paul Allison (yellow shirt). He has all different yummy flavors! You can buy from his website, too. Click here. The pavilion is where the main produce is located. It’s nice because it’s covered, it’s shady and it’s cooler. There are tables set up on either end for those who wish to sit and eat — or just sit! And there is always music and entertainment throughout the morning with plenty of chairs to kick back, relax and enjoy! By the way, this is my first ever video on my new phone. Another first is that I had to upload it to YouTube to be able to embed it here. My goodness, I’m learning so many new things. Perhaps I should seek employment in the IT field. HA! Uh, oh, definitely time to start heading home. The storm clouds are beginning to gather. I don’t mind walking in the rain but around here my concern is the lightning. But we made it home safe and dry. In fact, it was probably still another hour before the rains finally came down! Then, of course, it was nap time!! If you’re just joining us here, please feel free to visit the previous posts leading up to this finale. For the beginning of the story, click here to open Riding the Rails During the Great Depression, click here to open Dad’s Tour of the West Coast During the Great Depression, click here to open Yellowstone National Park 1931-32, and click here to open Yellowstone National Park 1931-32 Continued. Each link will open in a new tab. 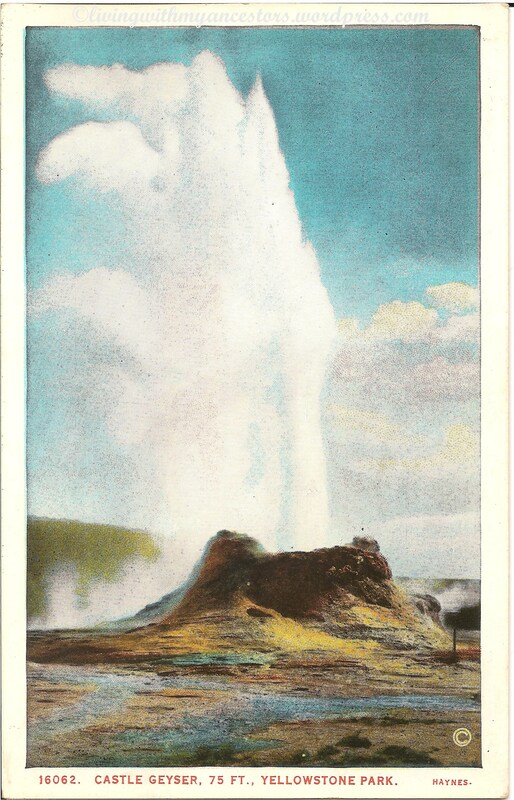 The cards were made by Haynes Picture Shops, Inc., 341 Selby Ave., St. Paul, Minn. and Yellowstone Park, Wyoming. Click on each Today for additional information. Please enjoy the cards! 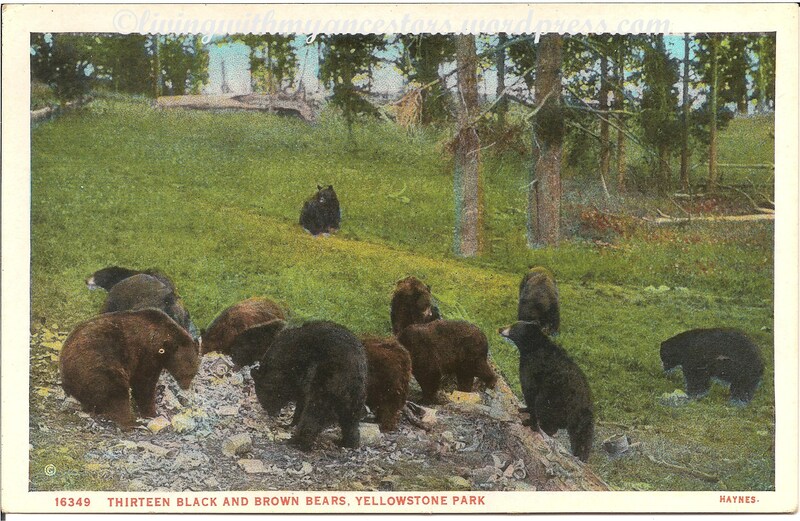 Bears of Yellowstone Park depend largely upon the hotels and lodges for sustenance during the summer season. Although bears boldly invade civilized areas to procure their food, they are far from tame. They should not be fed “by hand”, nor should they be molested. Today: Bears may be seen in Yellowstone March through November. Yellowstone is one of the only areas south of Canada that still has large grizzly bear populations. In 2007, the U.S. Fish and Wildlife Service announced that the Greater Yellowstone Area grizzly bear population segment had recovered sufficient numbers and distribution to be removed from the threatened-species list. In 2009, the delisting ruling was overturned and the population was returned to the threatened-species list; management continues under the 2006 revision of the recovery plan. Grizzly bears are usually seen in the open areas. Look for black bears along the edges of trees in the Lamar and Hayden valleys, or among the trees near Mammoth and Tower. Elk Stalled in Snow, Hayden Valley, Yellowstone Park. The latest official estimate of the number of elk, (Wapiti), in the park is given at nearly 20,000. Elk are seen throughout the park at all seasons. 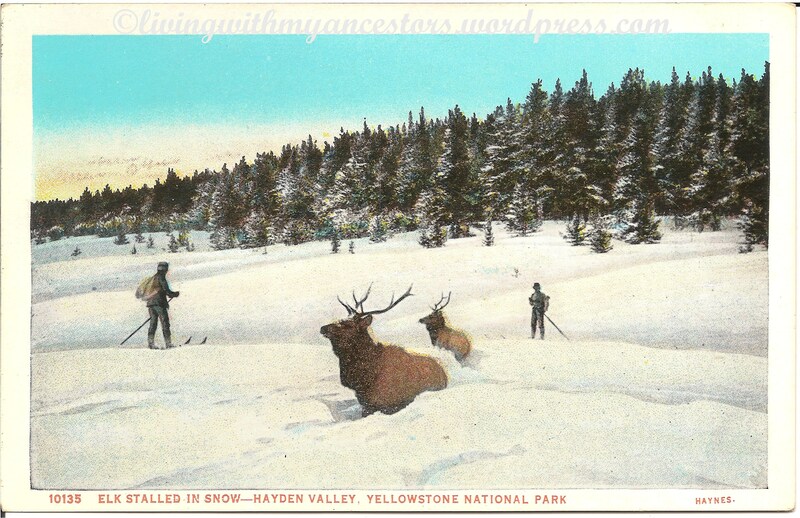 Today: National attention has been focused on Yellowstone’s northern elk winter range since the early 1930s. Scientists and managers then believed that grazing and drought in the early part of the century had reduced the range’s carrying capacity, and that twice as many elk were on the range in 1932 as existed in 1914. From 1935 to 1968, elk, pronghorn, and bison numbers were artificially controlled by shooting or trapping and removal by park rangers. Then in the 1960s, based on new studies that suggested ungulate populations could possibly be self-regulating, elk reductions were discontinued in the park. The belief that elk grazing was damaging to northern range vegetation and that grazing accelerates erosion, although not supported by research data and analysis, has continued to the present. Studies of the northern elk winter range began in the 1960s and revealed no clear evidence of range overuse (Houston 1982). More recent studies conclude that sagebrush grasslands of Yellowstone’s northern winter range are not overgrazed (Singer and Bishop 1990). In fact, plant production was enhanced by ungulate grazing in all but drought years. Protein content of grasses, yearly growth of big sagebrush, and seedling establishment of sagebrush were all enhanced by ungulate grazing. Neither reduction in root biomass nor an increase in dead bunchgrass clumps was observed. However, many questions remain concerning the condition of riparian zones and associated shrubby vegetation; the park hopes to conduct additional studies on aspen and willows and their relationship to ungulates on the northern range. Obsidian Cliff, Yellowstone Park, is on the Mammoth-Norris road, 12.3 miles from Mammoth Hot Springs. This volcanic glass brought Indians to the region in the early days for arrowhead material as the pipestone country of Minnesota attracted Indians to its quarries. Today: Obsidian Cliff, 11 miles south of Mammoth Hot Springs, is at the northern end of Beaver Lake in Yellowstone National Park. The cliff forms the eastern wall of a narrow cut in plateau country. At an elevation of nearly 7,400 feet above sea level, the cliff extends for a half mile, rising from 150 to 200 feet above Obsidian Creek and falling gradually away to the north. The upper half is a vertical face of rock; the lower half is composed of loose and broken rocks forming a talus slope. The cliff is the remainder of a flow of lava that erupted onto the earth’s surface and then poured down the plateau. 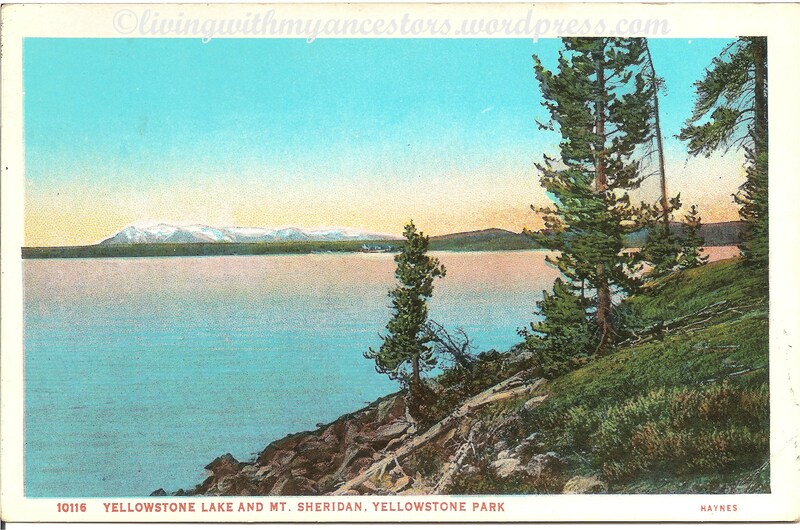 Mount Sheridan, elevation 10,250 feet, overlooks Yellowstone Lake which is the largest lake at its elevation, 7,730 feet, on the North American continent. It has a shoreline one hundred miles long. Today: With a surface area of 132 square miles, Yellowstone Lake is the largest lake at high elevation (i.e., more than 7,000 ft.) in North America. It is a natural lake, situated at 7,733 ft. above sea level. 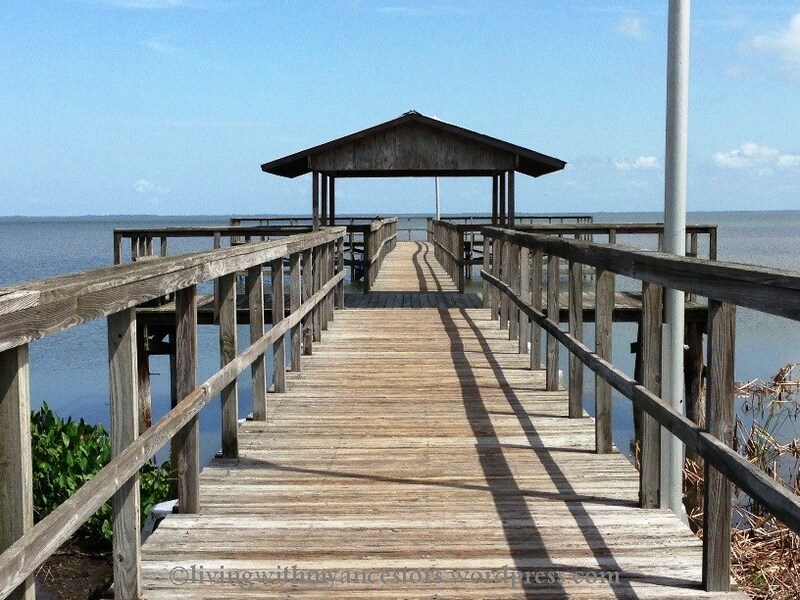 It is roughly 20 miles long and 14 miles wide with 141 miles of shoreline. It is frozen nearly half the year. It freezes in late December or early January and thaws in late May or early June. 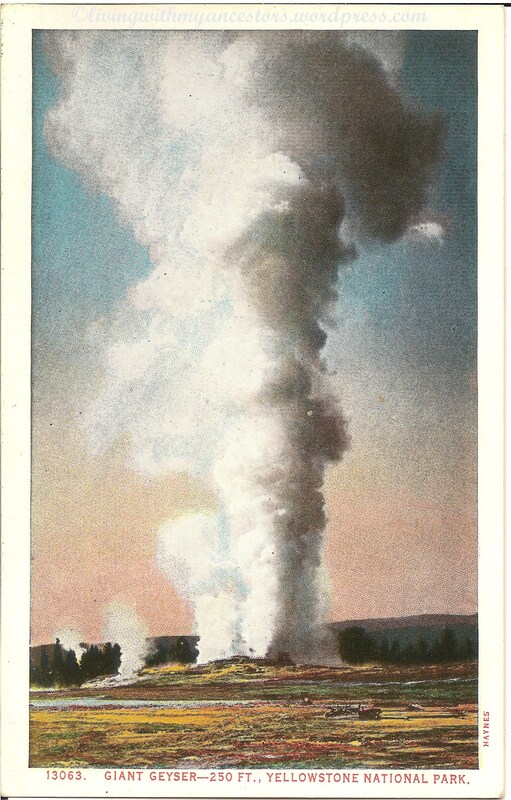 Old Faithful Geyser, Yellowstone Park, as depicted in this picture is one of the typical mid-day eruptions when there is sufficient breeze to waft away from the 150-ft. water column its envelope of steam. These displays occur summer and winter at intervals varying from 65 to 80 minutes. Today: Old Faithful erupts more frequently than any of the other big geysers, although it is not the largest or most regular geyser in the park. Its average interval between eruptions varies from 60 – 110 minutes. An eruption lasts 1 1/2 to 5 minutes, expels 3,700 – 8,400 gallons (14,000 – 32,000 liters) of boiling water, and reaches heights of 106 – 184 feet (30 – 55m). It was named for its consistent performance by members of the Washburn Expedition in 1870. 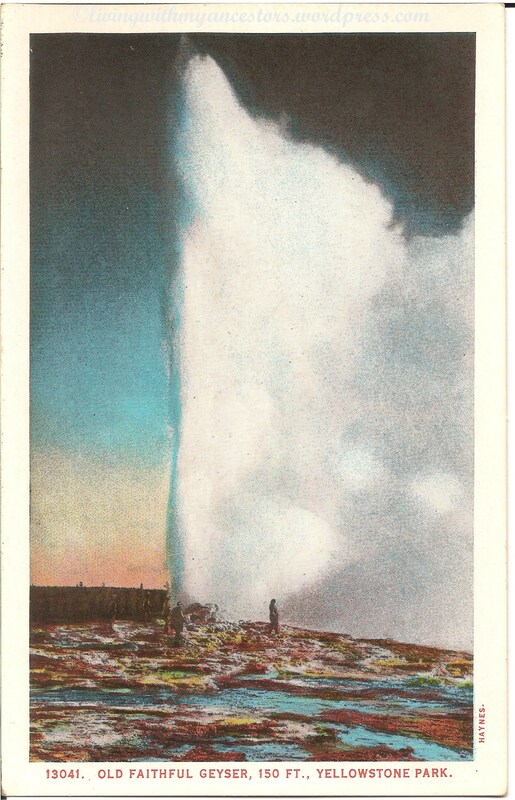 Although its average interval has lengthened through the years (due to earthquakes and vandalism), Old Faithful is still as spectacular and predictable as it was a century ago. (Another view) Old Faithful Geyser, 150 Ft., Yellowstone Park, is not the highest geyser, but it is by far the favorite one. Its eruptions occurring every hour last about four minutes. Today: Soon, a towering column of water will surge out of the earth as Old Faithful continues its unbroken series of eruptions. Eruptions occur an average of 17 times per day, every day. Because of changes in circulation that resulted from the 1959 Hebgen Lake and 1983 Borah Peak earthquakes, as well as other local and smaller earthquakes, the average interval between eruptions has been lengthening during the last several decades. 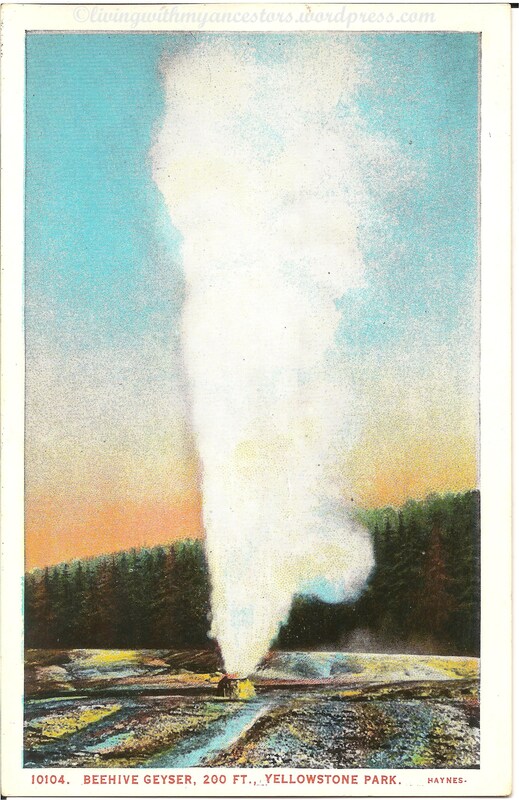 In the past, Old Faithful displayed two eruptive modes: short duration eruptions followed by a short interval, and a long duration eruption followed by a long interval. However, after a local earthquake in 1998, Old Faithful’s eruptions are more often of the long duration, long interval type. Kepler Cascade, Firehole River, Yellowstone Park, is seen shortly after leaving Old Faithful. It is 1.7 miles from Old Faithful, where platforms have been constructed to the edge of the canyon. Today: This three-tiered cascade drops over 50 feet as the Firehole River flows North. 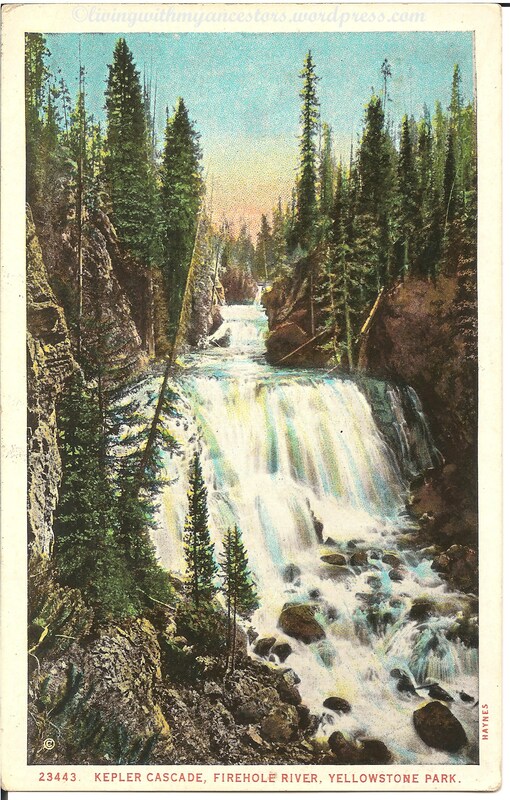 The Kepler Cascades were actually named in 1881 for the 12 year old son of Wyoming’s territorial governor, Kepler Hoyt, who toured the park with his father, Governor John Hoyt. Norris Geyser Basin, Yellowstone Park, is most remarkable. Some of its waters deposit brightly colored arsenic minerals — orpiment and realgar, others yellow sulphur and black sulphur globules. Its steam vents are the hottest in the entire region. Today: Norris Geyser Basin is one of the hottest and most dynamic of Yellowstone’s hydrothermal areas. Many hot springs and fumaroles have temperatures above the boiling point (200°F) here. Water fluctuations and seismic activity often change features. It’s hard to imagine a setting more volatile than Norris. It is part of one of the world’s largest active volcanoes. And it sits on the intersection of three major faults. One runs from the north; another runs from the west. These two faults intersect with a ring fracture from the Yellowstone Caldera eruption 640,000 years ago. 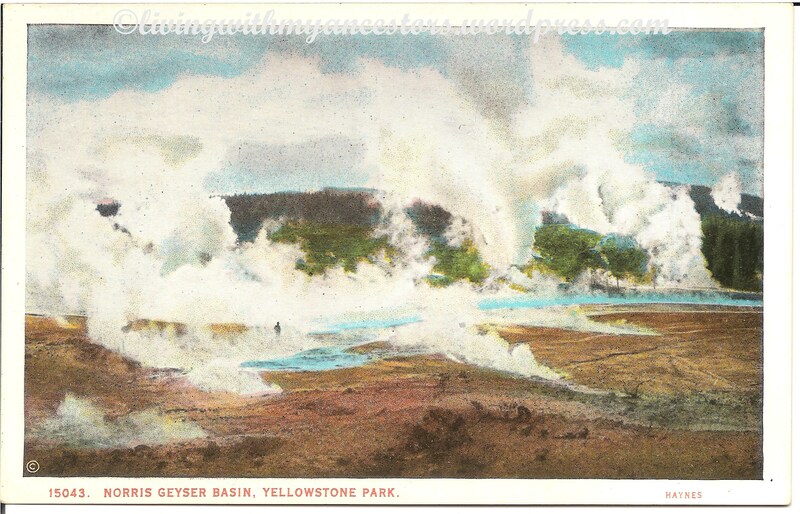 These conditions helped to create this dynamic geyser basin. 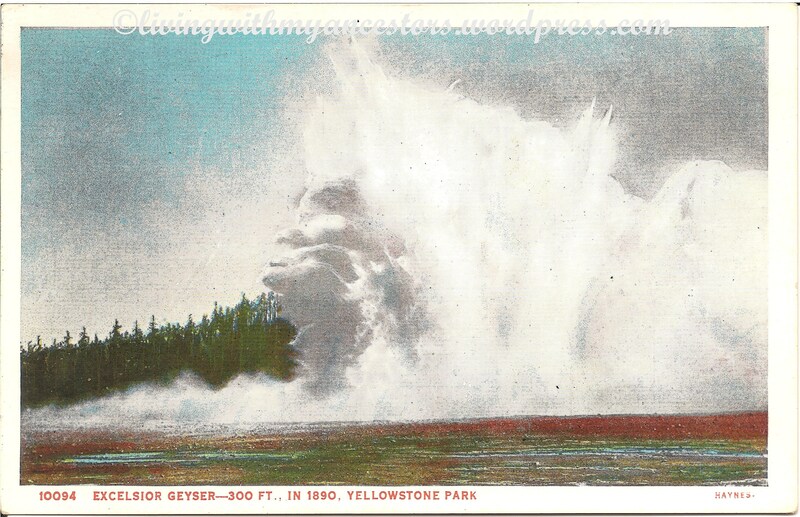 Excelsior Geyser, Yellowstone Park, was at one time the largest geyser known. Its eruptions were 300 feet high, and the width of the water column was equally great. The eruptions were so tremendous that the crater was blown out at one side and it ceased to play in 1890. Giant Geyser, Yellowstone Park, is the greatest geyser in the world today in point of height and duration of eruption. It plays 250 feet high for a few moments in the earlier part of each display,and continues for an hour and a half at lesser heights. Its intervals of quiet between eruptions vary from six to fourteen days. Today: Giant Geyser truly lives up to its name. It is currently the second tallest geyser in the world, only Steamboat Geyser located in Yellowstone’s Norris Geyser Basin is taller. An eruption of Giant can reach 250 feet, last over an hour and put out an estimated one million gallons of water. For comparison, a large Old Faithful eruption reaches about 150 feet, lasts less than 5 minutes (the biggest part lasts less than one minute) and puts out around 10,000 gallons of water. Giant Geyser Cone, Upper Geyser Basin, Yellowstone Park, is the orifice of the highest geyser in the park. It plays 250 feet high at varying intervals — 100 feet higher than Old Faithful Geyser. Its cone with one side gone is today just the same as when it was first discovered. 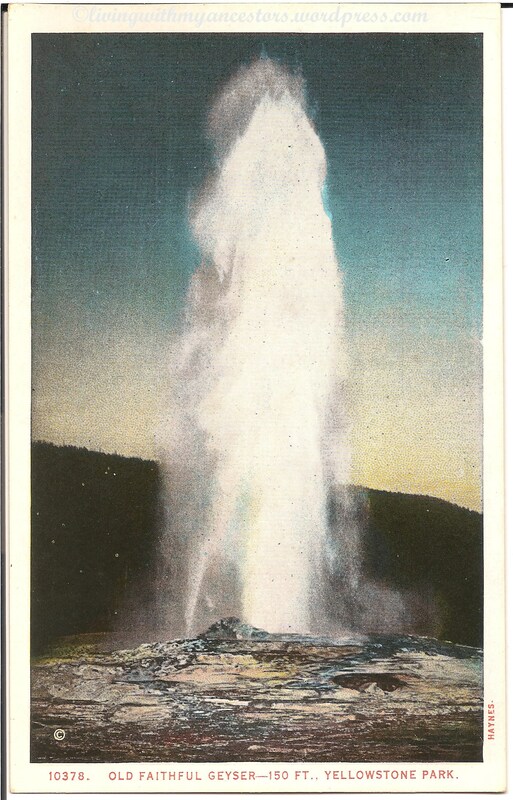 Today: Giant Geyser was dormant for many years after the energy shift in 1955. Since then, it has slowly become active again. During 1997, its eruptions occurred every 3 – 10 days. This spectacular geyser’s eruptions last about an hour and can reach heights of 180 – 250 feet (55 – 76m). During eruptions small geysers nearby may also erupt. Beehive Geyser, 200 Feet, Yellowstone Park, although seldom in eruption is one of the most striking geysers in the park. It plays out of its nozzle-like opening like a giant fire hose with a great roar. Eruptions last 15 minutes. Today: Beehive Geyser is magnificent. Eruptions usually occur twice each day with displays lasting 4 – 5 minutes. During an eruption, the narrow cone acts like a nozzle, projecting the water column to heights of 130 – 190 ft (40 – 55m). 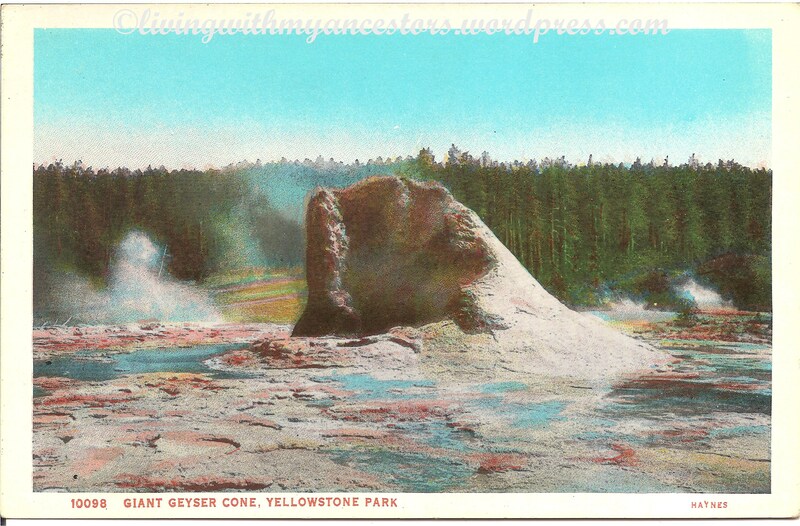 Castle Geyser, 75 Ft., Upper Basin, Yellowstone Park, has one of the most prominent geyser cones in the park, indicative of great antiquity as the geyserite, a silicious deposit, forms extremely slow. Today: Castle Geyser has the largest cone and may be the oldest of all geysers in the basin. Its eruption pattern has changed considerably throughout its recorded history. Castle is currently erupting about every 10 – 12 hours. A water eruption frequently reaches 90 feet (27m) and lasts about 20 minutes. The water phase is followed by a noisy steam phase lasting 30 – 40 minutes. 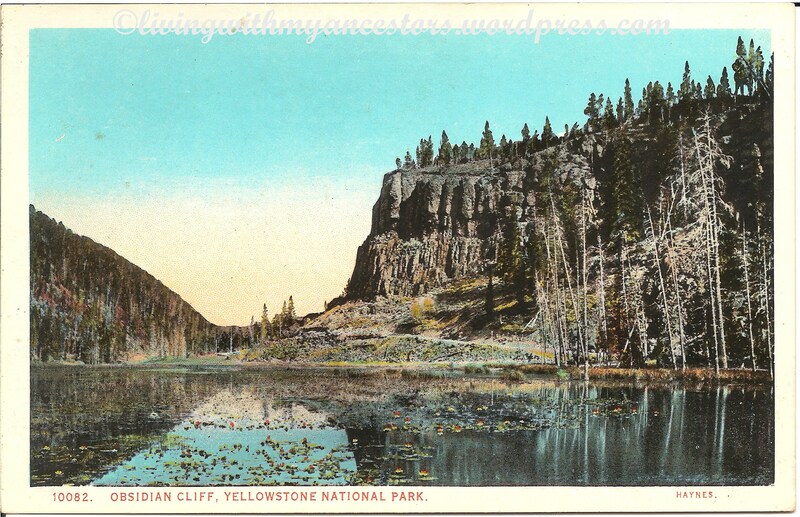 I hope you’ve enjoyed this nostalgic Yellowstone tour!